The debate over an Equal Rights Amendment began three years after women received the right to vote. We’re spotlighting the issue today, because it’s been recently re-introduced in this Congress. We hope you’ll share your views on POPVOX — and we’ll deliver your message to Congress. 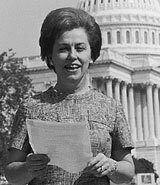 Congresswoman Griffiths was able to get the necessary 218 signatures on her discharge petition (see the signatures) in 1970, and the ERA was passed by the House that same day. In the Senate, however, opponents added an amendment to the ERA exempting women from the military draft, which Griffiths battled against. She introduced the ERA again in the next Congress, and it was passed by the House in 1971 and by the Senate in 1972. Congress also proposed state ratification by three-fourths of the states (38) within seven years, which was extended to 10 years. By 1982, the Amendment had the approval of 35 states — three short to change the Constitution. Nearly half of all states today have a version of the ERA written into their state constitution. In May 2015, Senators Ben Cardin (D-MD) and Bob Menendez (D-NJ) introduced joint resolutions that “would rejuvenate efforts to ratify an equal rights amendment (ERA) to the US Constitution.” Senator Cardin’s resolution, SJRes 15, would remove the deadline for states to ratify the Equal Rights Amendment that has already been ratified by 35 states. Senator Menendez’s resolution, SJRes 16, “would begin the process anew, giving all states a fresh opportunity to voice their support for women’s equality,” according to the sponsors. Companion resolutions, HJRes 51 and HJRes 52 were introduced in the House by Congresswomen Carolyn Maloney (D-NY) and Jackie Speier (D-CA). Weigh in on the Equal Rights Amendment — and whether the deadline for ratification should be removed. POPVOX will deliver your message to your lawmakers. The Equal Rights Amendment (SJRes 16) and in the House, HJRes 52: Proposing an amendment to the US Constitution relative to equal rights for men and women. 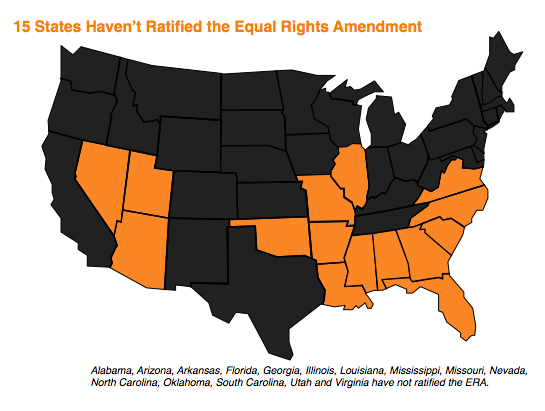 SJRes 15 and HJRes 51: A joint resolution removing the deadline for the ratification of the equal rights amendment.